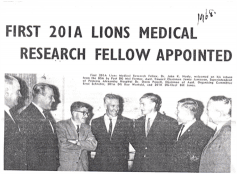 The Lions Medical Research Foundation has a long and successful history. It began as an idea put forward at a Lions Convention in 1963. A Lions member, Mr John Henley, who at the time was a member of the Board of the Princess Alexandra Hospital, successfully moved a motion at the convention that “Lions resolve to establish a laboratory at the Princess Alexandra Hospital, Brisbane, Australia, in which to conduct research into kidney disease”. Forty Lions clubs supported the project with yearly contributions over a minimum of three years to provide the necessary funding. 1963 – A group of Lions Members, Mr John Henley, Mr Rae Strain, Mr Robert Allen and Mr Ray Phippard, discussed at a Lions Convention the need to fund research into kidney disease. Lions Club members embraced this idea and later expanded this funding into other medical areas. 1966 – Dr John Healy was the Foundation’s first recipient of funding for research. Dr Healy was working at Georgetown University Hospital in Washington DC, USA, but returned to Australia to become the first Lion’s Research Fellow at the Princess Alexandra Hospital, Brisbane. By 1978, Dr Healy had won world acclaim by publishing nineteen articles and developing the kidney function test which became widely accepted. 1973 – A decision was made to name the Foundation the “Lions Kidney and Medical Research Foundation”. 1975 – Memorandum of Association and Articles of Association approved by Lions Clubs International and the Queensland State Government. 1977 – The Foundation established a research centre at the Princess Alexandra Hospital. 1978 – The Lions Medical Research Foundation provided $1.2 million towards building and outfitting the Research Centre at the Princess Alexandra Hospital, Brisbane Queensland. 1985 – A bright new molecular biologist, Dr Ian Frazer, was funded by the Foundation to research 4h drugs used in the treatment of AIDS. Dr Frazer was about to return to Scotland, but with this funding was able to move from Melbourne to Brisbane to continue his research. Dr Frazer also had ideas on how immunology might provide a vaccine to prevent cervical cancer. The now Professor Ian Frazer went on to a world first in the invention of the Cervical Cancer vaccine “Gardasil” and became the CEO of the Translational Research Institute which opened in 2013. 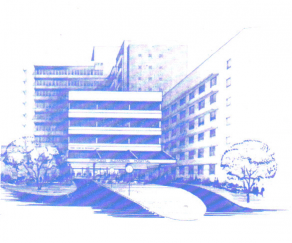 1986 – The completion and opening of the Lions Kidney & Medical Research Building at the Princess Alexandra Hospital. 1986 – Lions Professor of Ophthalmology, Prof. Lawrie Hirst received $250,000 to outfit his area of research which led to the Queensland Eye Bank storing corneas prior to transplantation. 1989 – Dr Harvey Whiteford, Biological Psychiatry; the funding led Dr. Whiteford to establishing the Queensland Centre for Mental Health Research. Professor Whiteford has an international reputation in mental health policy and held the first mental health position with the World Bank. Prof. Whiteford is now the Kratzmann Prof. of Psychiatry & Population Health at The University of Queensland and Director of Policy & Evaluation at the Queensland Centre for Mental Health Research of which he was instrumental in forming. 1991 – Dr George Mellick, trained in chemistry and biochemistry, was awarded a Lions Postgraduate Scholarship towards the completion of his PhD in medicine. Dr Mellick worked in the Centre for Genomics & Bioinformatics in Sweden, returned to Australia lecturing in School of Medicine UQ. He researches neurodegenerative diseases such as Parkinson’s Disease within Griffith University. 1991 – Dr Robert Tindle began a five year Lions Fellowship. Dr Tindle worked with Prof. Ian Frazer on the immunology of human papiloma virus infection. Dr Tindle now has an international reputation in the field of HPV. 1992 – Prof. Paul Colditz was appointed Lions Research Fellow at the Perinatal Research Centre at the Royal Brisbane & Women’s Hospital. Prof. Colditz is now the Director of the Perinatal Research Centre. 1994 – Dr John McGrath, research into schizophrenia, genetic and non-genetic causes. He is Queensland’s Centre for Medical Health Research Director, Developmental Neurobiology and Epidemiology. Dr McGrath won the Premier’s Award for Medical Research in 2002 and in 2003 was awarded a Queensland Smithsonian Fellowship. 1997 – In order to incorporate the research being undertaken by the LMR, the name “Lions Kidney & Medical Research Foundation to “The Queensland & Northern New South Wales Lions Medical Research Foundation”. 1998 – Dr Paul Lovelock, a molecular biologist researching better treatments for Diabetes. 1998 – Dr Carol Brown, research into perinatal care. 2002 – The commissioning of the second floor of the new research building after the demolition of the Lions Building within the Princess Alexandra Hospital. Plus a Memo of Understanding between the Diamantina Institute for Cancer, Immunology and Metabolic Medicine and the Foundation was signed. 2002 – Dr Jon Whitehead, Research into insulin resistance in Type 2 Diabetes – links with obesity. 2003 – Dr Jonathan Golledge, James Cook University. Role of diabetes mellitus in artery complications. Work is targeted at development of a medical treatment for aortic aneurysm. Improve understanding of factors involved in the weakening and abnormal dilation of the main abdominal artery. 2003 – Dr Julie Jonsson, research to find out how fatty liver increases fibrosis. Dr Jonsson hoped by defining the mechanisms responsible, she could identify possible therapeutic targets for drug development to treat chronic liver disease. 2004 – Dr Corey Moran, James Cook University. Research into the dangers of arteries rupturing in men over 60 years. 2004 – Dr Peter Madden, Initial examination of Australian made media to allow organ culture of corneas and thereby extend storage from the current 7 days to 30 days. 2004 – Dr G. Leggatt, Understanding of killer T cells biology such that imporovements can be made in the next generation of vaccines targeting tumours and viral infections such as HIV. 2005 – Dr Heather Beamish, Improving treatments involving the identification of mutations in cancer cells and specifically targeting those mutations. 2005 – Prof. Paul Colditz, Research into brain development, hyuposic damage in brains and kidney, ensuring that mothers and babies receive the optimal evidence based investigations and treatments. 2007 – Dr Kathryn Buller, determing mechanisms contributing to brain injury in premature neonates. 2008 – Dr Gethin Thomas, Identification and characterisation of novel genes involved in bone and joint disease, specifically a form of arthritis affecting the spine called ankylosing spondylitis and osteoporosis. This increased knowledge of the disease processes can then give rise to new drugs and treatments. 2008 – Dr Christine Staatz, Tailoring doses of the newer immunosuppresent drugs to improve outcomes after transplants. 2008 – Dr Ingrid Hickman, Obesity related inflammation and insulin resistance in chronic Liver disease. Exercise and diet as treatment options. 2010 – Dr Katrina Campbell, Nutrition-related mediators of cardiovascular disease progression in chronic kidney disease (CKD). Many risk factors for both cardiovascular disease and kidney disease progression, including high blood pressure, vascular stiffness, fluid overload, urinary protein and inflamation are linked to dietary intake. This research aims to identify the relationship between diet and heart health in patients with kidney disease. In addition, this research aims to test the effect of a low salt diet, and other dietary interventions on kidney and heart health. 2011 – 2018 – Dr Tracey Bjorkman, researching hypoxic injury in newborns; seizures and brain injuries, neuroprotective therapies, Perinatal GABA receptive development. 2012 – Dr Nadeeka Dissanayaka, researching anxiety and depression in Parkinson’s disease sufferers. 2016 – Dr Carlos Salomon, research to better understand the origins and causes of Ovarian Cancer, and screening and prevention by altering the profiles of exosomes. There are 225,000 reported new cases of Ovarian Cancer each year. There are many successful medical researchers who have received funding through the Foundation. Today, the Foundation supports medical research at the Princess Alexandra Hospital, Royal Brisbane & Women’s Hospital and the School of Pharmacology, University of Queensland. Other notable recipients are Professor Ian Frazer who received early funding for his now world famous research into cervical cancer, Professor Lawrie Hirst’s groundbreaking Optical research, Professor Paul Colditz’ Perinatal research into preterm babies and Dr Kathryn Buller’s research which examined brain injury in neonates plus many other worthy researchers. The Queensland and Northern New South Wales Lions Medical Research Foundation is committed to start-up funding for world class medical research.